Temple Church is a remarkable building because it has survived largely intact in the centre of a major city for over 800 years, and because it has been the scene of key events in British history. Its role in Dan Brown’s The Da Vinci Code and subsequent surge of popularity is merely the most recent chapter in a long and distinguished history. 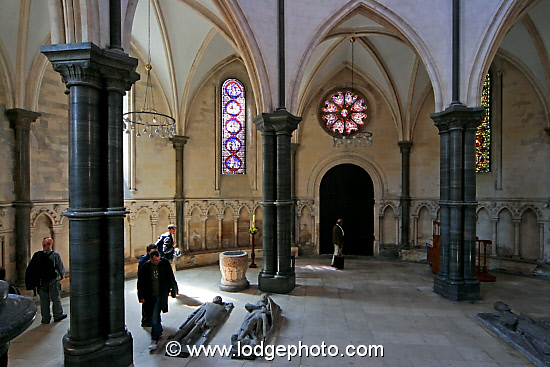 Temple Church was consecrated in 1185 by the Patriarch of Jerusalem in the presence of King Henry II. It is one of the oldest buildings in London: only Westminster Abbey and the White Tower at the Tower Of London are older, and is one of the few remaining examples of Romanesque architecture left intact in the city. The building’s architecture is the most striking feature when you first approach the church, which is found by navigating a series of narrow alleyways between Fleet Street and the Embankment alongside the river Thames. Suddenly, you find yourself in an open square right next to a round crenelated building of honey-colored sandstone, attached to a larger rectangular structure. The round section of Temple Church was built first and is based on the church on the temple mount in Jerusalem. In The Da Vinci Code, Dan Brown attaches significance to the fact that the design doesn’t follow the typical cross-shaped plan of Christian churches, implying that it is a deliberately pagan design. While that suits the conspiratorial nature of the plotline, the design is actually a deliberate echo of Jerusalem's Church of the Holy Sepulchre in what was (at the time) the Christian Holy Land. This is the site where the Templar order was founded. That church is round because it's a conversion of an older Roman building. The larger rectangular section that now forms the chancel of Temple Church was added in the 13th century in response to Henry III’s desire to be buried there. Without an extension, there was no way to accommodate the large tomb of a king. The chancel was consecrated on Ascension Day 1240, but Henry III later changed his mind is interred in Westminster Abbey instead. The oldest part of Temple Church in London, modelled after the domed Church of the Rock in Jerusalem. The church opening hours are limited, and it does not open every day. Hours are posted outside and on the website, so it pays to plan ahead if you want to go inside. I visited on a Friday lunchtime, when the current master of the temple, Robin Griffith-Jones, offered a free lecture on Temple Church and The Da Vinci Code. Heading inside the church by the West door, you are immediately greeted by the sight that makes the church such a good location for The Da Vinci Code – the effigies of the Knights Templar on the floor of the round church. There are nine effigies in total, including those of William Marshall, 1st Earl of Pembroke, and his sons dressed in full knightly attire. William began his career earning a living by winning tournaments: he was an accomplished jouster and swordsman, and tutored the young Henry I in chivalry. The plot of the movie A Knight’s Tale is loosely based on William Marshall's early life. He went to the holy land as a crusader in 1183-1186 at the request of a dying Henry II (rumor has it as a result of getting too close to Henry's wife), where he first encountered the Knights Templar, though he did not join the order until a few months before his death in 1219. As The Da Vinci Code is quick to point out, these are effigies and not tombs – although William Marshall and his sons were originally buried in Temple Church, their remains are no longer here. The effigies are made from high quality Purbeck marble, which is quarried in Dorset, hundreds of miles to the South-West of London. The effigies of William and the other knights in the church are damaged, a result of a May 1941 incendiary bomb that hit the roof of the church, only shortly before Nazi Germany halted bombing raids on Britain. The fire consumed the roof, wooden interior and organ, damaged the effigies and badly cracked the marble columns – the roof is held up today by 20th century copies made from the same stone. The wooden interior destroyed in World-War II was Victorian, dating from 1841. During reconstruction after the war, the wooden interior installed by Sir Christopher Wren sometime after the great fire of London in 1666 was discovered in storage, and that interior forms the core of what you can see today in the chancel. Temple Church wasn’t damaged during the Great Fire, but Wren "restored" it nevertheless; the original interior was lost. William Marshal, first Earl of Pembroke and Templar Knight, who died in 1219. Temple Church, London, UK. Temple Church stood at the center of a larger Templar compound. As Robin Griffith-Jones explains in his talk, the Templars were rich and influential because they developed the foundations of modern banking. You could give the Templars your money in London, travel to Jerusalem and get the same amount back from the Temple there, less a commission. In a time when traveling with money incurred serious risk, this was a useful and important service, especially during the crusades. Ultimately, the Templars incurred the wrath of Kings and Popes by refusing to forgive the debts of either, or to hand over money they desired to seize from unfortunate nobles. It was this that ultimately led to the Papal order by Pope Clement V dissolving the order and seizing its assets on Friday, 13 October 1307. Temple Church was taken over by Edward II after the dissolution of the Templar order, and it was eventually given to another knightly order similar to the Templars, the Knights Hospitallier. They rented some parts of the compound to two colleges of lawyers. Three hundred years later, after the break with Rome under Henry VIII and the establishment of the Church of England, the lawyers were granted use of the land and the church in perpetuity. Today, the church is still surrounded by lawyers, now known as the Inns of Court, and specifically Inner Temple and Middle Temple. Standing outside, you’ll see British Barristers clutching briefs hurrying to and from the nearby law court on Fleet Street. In The Da Vinci Code, Langdon and the other characters realise they’re in the wrong place and immediately dash off to Westminster Abbey in search of the next clue. Unburdened by any requirement to find the Holy Grail before The Bad Guys, I recommend regular visitors to Temple Church spend a little longer enjoying a remarkable building containing some of the most important Knights in British history, especially if the Master Of The Temple is providing an entertaining free lecture. (c) Copyright 2006-2014 Mathew Lodge / www.lodgephoto.com. Reproduction in any form without written permission is prohibited.